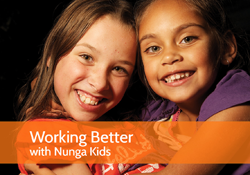 Aboriginal workers will share their knowledge and skills to help you develop a culturally appropriate approach to working with Aboriginal children. Participants will be introduced to Healing the Aboriginal Way using the spheres of Mind, Body and Spirit and will learn about their interconnectedness and that for Aboriginal people the three spheres must be healed. The workshop is interactive and includes the concept of Deep Listening or Dadirri. ‘Aboriginal people passed on stories orally as they knew no writing. Listening to the storyteller was vital to reproduce the story accurately to the next generation of story-tellers. Deep listening describes the processes of deep and respectful listening to build community—a way of encouraging people to explore and learn from the ancient heritage of Aboriginal culture, knowledge and understanding. Working through a trauma lens, participants will develop their understanding that children’s behavior is communication, and responses to Aboriginal (Nunga) children and their parents must be therapeutic, taking into account the effects of intergenerational trauma and encouraging and supporting connection and pride in their culture. Developed in collaboration with Together4Kids this program is facilitated by Senior Aboriginal workers from Relationships Australia SA. This program can be tailored to meet the needs of individual teams and/or organisations. To view the suite of child-focused specialist training offered by Together4Kids click here.